Attend this session and find out how email and social can increase the consumption of your rich media content AND get you more inbound links, tons of fans and followers and how to convert them into loyal customers. In this webinar, email marketing expert Tamara Gielen will discuss 7 proven email marketing tactics that B2B marketers should use to drive more conversions for their campaigns. Triggered email campaigns deliver the highest ROI and have the highest open and clickthrough rates - if executed well. In this webinar, Tamara Gielen will discuss 5 key things you need get right to make your automated email campaigns wildly successful. In this session, Tamara Gielen will share tips on how to write copy that persuades your audience to take action. We'll look at headlines, subject lines, bullet points and call-to-actions. We all know that visitors don't convert into valuable leads or buyers at their first visit to your site. In this session, Tamara Gielen will explain how you can convince your visitors to sign up to your mailinglist and how to optimize the entire sign-up process (from sign-up form to welcome/onboarding program). Email has been declared dead a thousand times already but it's still alive and kicking - and stronger than ever. Running an eCRM strategy without email is like swimming without water, it just doesn't work. 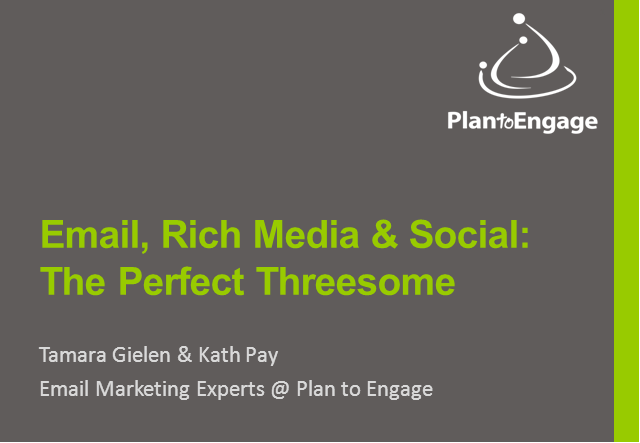 In this session, email marketing guru Tamara Gielen will share what works and what doesn't when it comes to using email to manage customer relationships both in a B2C and a B2B environment. Email is a very effective tool to promote webinars. In this session you'll learn tips and tricks on how to use email to drive the maximum number of registrations for your webinar. Tamara will talk about subject lines, the structure of your email campaigns, timing and frequency of your email promotions, calls-to-action and lots more. As usual, this will be a session with lots of practical takeaways that you can implement immediately. Don't miss it! Tamara Gielen will present on Email Trends for 2011. Tamara is 100% focused on email marketing. In-depth knowledge and experience with this channel deliver the kind of quality and results that a generalist cannot offer you. Email marketing is one of the most powerful online marketing channels and if you combine it with social media, you'll create a real powerhouse. In this session, you’ll learn how to combine these two channels to drive more leads and increase your customer base. Tamara Gielen is an expert and thought leader in the email marketing field. As an independent digital direct marketing consultant she helps customers harness the power of email marketing, blogging & social media to attract customers, establish thought leadership, nurture relationships and increase sales. Previously, she has held various online marketing positions at companies such as Cognos, eBay and OgilvyOne. Tamara is a well-known blogger at www.b2bemailmarketing.com and the founder of the Email Marketer's Club, an email marketing community with over 3,500 members. Learn how to build and implement an email marketing strategy that drives growth for your business. This channel, hosted by one of the world's top influencers in email marketing, Tamara Gielen, brings you practical advice, tips and tricks that you can implement immediately.